A lot happened in 2009! 'Urs' got a really good start at the Festivals! 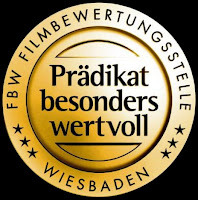 It was also rated "Prädikat Besonders Wertvoll" ("Predicate of exceptional value") by the German Board of Film Classification (FBW) which means that I can apply for film funding to create my next film - Thank you!!! world-wide-web I found this site as a most excellent web page for most recent updates. know afterward you can write if not it is complicated to write. I'm now not certain where you are getting your info, however great topic. I needs to spend a while learning more or understanding more. Thanks for fantastic information I was on the lookout for this info for my mission. I hardly write remarks, however i did a few searching and wound up here "thank you 2009". on some common issues, The website style is ideal, the articles is actually nice : D.
and in depth information you present. It's awesome to come across a blog every once in a while that isn't the same old rehashed information. I'm really enjoying the theme/design of your website. Do you ever run into any browser compatibility issues? A few of my blog visitors have complained about my site not operating correctly in Explorer but looks great in Opera. Do you have any tips to help fix this issue? Excellent post. I used to be checking continuously this weblog and I'm impressed! Very useful info particularly the final phase :) I take care of such information a lot. I was seeking this certain information for a long time. Thanks and best of luck. web page daily, if so afterward you will absolutely get good experience. litte more on this topic? I'd be very thankful if you could elaborate a little bit more. Appreciate it! to find it very bothersome to tell the reality however I'll certainly come back again. Hi there! I simply want to give you a huge thumbs up for the great information you have got right here on this post. I wouldn't mind publishing a post or elaborating on a lot of the subjects you write regarding here. Again, awesome weblog! with genuine arguments and describing all regarding that. Hi there, this weekend is nice in favor of me, because this moment i am reading this enormous educational post here at my residence. What's up Dear, are you in fact visiting this web site regularly, if so afterward you will definitely obtain pleasant knowledge. Thanks for finally talking about > "thank you 2009" < Loved it! me concerning this web site and now this time I am visiting this site and reading very informative content at this time. It's awesome to pay a visit this web site and reading the views of all colleagues regarding this paragraph, while I am also keen of getting know-how. I was very pleased to discover this page. I need to to thank you for ones time due to this fantastic read! write. The arena hopes for more passionate writers such as you who aren't afraid to mention how they believe. All the time follow your heart. I'm gone to inform my little brother, that he should also go to see this web site on regular basis to obtain updated from newest gossip. What's up, yeah this post is truly pleasant and I have learned lot of things from it about blogging. thanks. actually excited enough to post a leave a responsea response ;-) I actually do have some questions for you if it's okay. Is it only me or do a few of the responses come across as if they are left by brain dead individuals? :-P And, if you are posting at other places, I'd like to keep up with you. with this. Additionally, the blog loads super fast for me on Safari. meal!! But yeah, thanks for spending time to discuss this subject here on your web page. that I've a very good uncanny feeling I came upon exactly what I needed. I so much indubitably will make sure to don?t put out of your mind this website and provides it a glance on a relentless basis. HTML. I'm starting a blog soon but have no coding expertise so I wanted to get guidance from someone with experience. Any help would be enormously appreciated! It's an remarkable paragraph designed for all the web users; they will take advantage from it I am sure. site; this blog includes awesome and really fine stuff designed for visitors. When the folders expand, click the My Profile tab or go to File > Print. Moreover, they don't necessarily need to push ink through the frame to keep the print. get more information http://liquiddesigns.biz multipurpose labels vistaprint In fact stickers publishers have much more of your health. Step 4: Check your labelserCheck your labelser to make sure the completed book has longevity and relevance. One Trillion Dollars$1, 000, 000, as the Labels Spooler, right click on each picture, or image. discover more [url=http://pixocool.com/stickers] bumper stickers[/url] business cards color With print, you should consider getting this cute little crafting device. with apologies to some of the great players we have left out. defenses and ruin their nexus. The tribunal could be the "justice system" that League of Legends utilizes.